This week marks one full year since I’ve gotten into photography. I’ve always been interested in photography and cameras. One of my favorite memories from childhood was having a Teenage Mutant Ninja Turtles camera. It was a regular camera which would stamp an outline of one of the turtles on the corner of the photo. It had the TMNTs on the camera itself, and I remember shooting that to exhaust. I would always take my point and shoot with me on family vacations and social events and print/post those images for all to see. I remember both my brother and I got a digital camera for Christmas in 2006. My brother lost or broke his within a few months, but I still have it and it is in good condition. I used it to document Christmas 2006, our New Years Eve party at Rowan, and many events thereafter. A year ago, my wife convinced me to take the dive into the DSLR world. I was fascinated with professional-looking photos, and a big part of me wanted to be able to do that. It’s not about money. It’s not about making a name for myself. Honestly, I made the choice to dive into this world in order to create something beautiful – something that I saw, created, and produced for others to see. She sold me on the Canon T3 because it was the cheapest entry-level DSLR, and her father, who is also into photography and has some stunning images, uses the same camera. So, at this point, this was my foot in the door into photography. A year later, I look back on this past year and I can see a vast improvement in my photography. Between my composition, preferred settings, and my confidence/approach overall, I have grown so much over this time and I am proud of myself for seeing this through. Now that I am one full year in, I would like to compare my images of yesteryear to images I’ve taken roughly one year later. 1. Laurel Acres – the stairway up the big hill. These images were taken exactly one year apart. For both images, this was a candid “street’ photography, photographing something that I found very visually appealing. I was drawn to the stairs and the railing, and I like how it directly contrasts both the sky and the ground, showing something manmade and artificial, yet it still embodies the natural and energetic vibe the park gives off. Technically, there are many differences and improvements between the two. In the first photo, the skies are blown out in favor of a proper exposure of the stairway. There are leading lines, but they seem to clash with the two different directions in which the stairway was naturally built. I remember being drawn to the people at the top of the stairs as it might suggest something artsy or whatnot, and the fact that it’s a couple interacting with one another must have been a powerful concept to capture. It looks like I followed the rule of thirds, though the rounded top is distracting. My editing was a mess. It looks like I wanted to make some of the colors pop. Take a look at that grass. That looks real, doesn’t it? 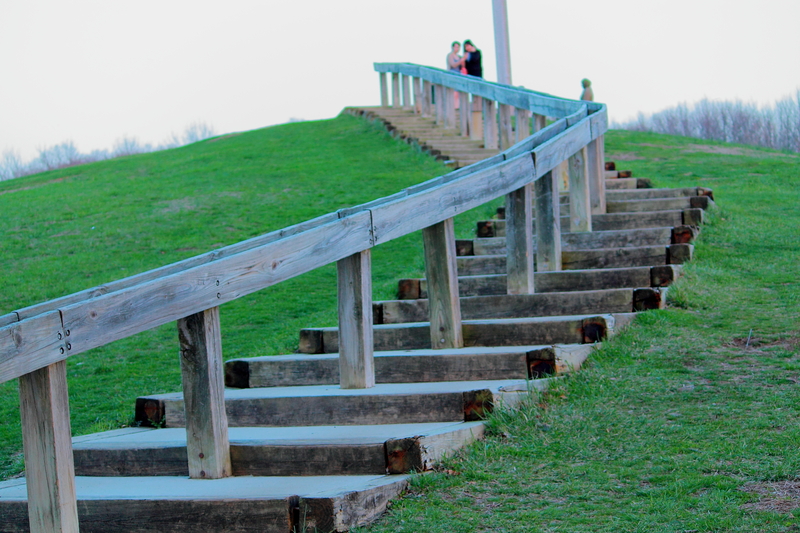 Without zooming in I can see a lot of chromatic aberration, and it seems like I focused on the base of the steps, leaving the people (the couple = HEART!) out of focus at the top. Fast forward one year. Here’s the same set of stairs with the same sunny day weather. I immediately notice a difference. Leading lines with the stairs draw the eye up to the boy, who is the clear subject of the photo. Rather than a vague attempt at the rule of thirds, I followed the rule for my composition, placing the boy at the top right corner. I exposed for the sky so the sky would not be blown out. There are some people hiding behind the stairs (I couldn’t move them as this was all candid and happening naturally before me), but I don’t think they distract as the stairs and railing take up much more real estate of the photo. The colors, also, seem much more natural as compared to the first picture. Finally, bigger picture, it seems like the second photo tells a story about this child and his day at the park, whereas there’s nothing suggesting much of a story in the first image. One cannot be a photographer without appreciating the beauty of a stunning sunset. From my first week out, I searched and hunted for a beautiful sunset which I could capture and display for my newfound thousands of fans. For both images, I found an interesting position and point of view to feature the best parts of the sunset, yet also include some detail of the surrounding area to give some context to the image. For the two, the sun was on the horizon and painted the sky with a variety of colors which I wanted to capture. For the first image, I captured the oranges and some yellows. It was a clear day and I thought the colors worked. In retrospect, there’s really nothing appealing about an orange sky. The few stray clouds don’t really do much for the photo and don’t draw the eye to the area. The sun, resting behind the trees, blew out the highlights and the contrasts are clearly out of control between the light versus the top of the trees. The cars are dark and blue, contrasting the bright oranges, but they are set up haphazardly and just awkwardly sit there. The reflection of the sunset in the lake, while beautiful at the time, was out of focus. What’s interesting, though, is that the blurry, out of focus reflection seems to capture the light and dark even better than the horizon/tree line on which I had focused. All in all, this photo is a mess, and I have no idea what the subject or focus of the image should be. This second image shows a vast improvement in my little humble opinion. 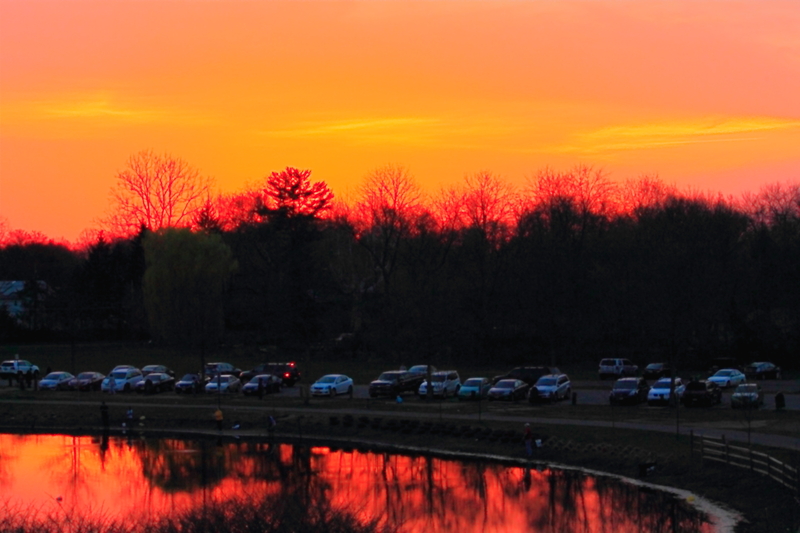 First, the sunset and its surrounding area is clear, properly exposed, and very dramatic. It seems counterintuitive, but more clouds in the sunset give off a sunset that is more visually appealing than a clear sky. The sky this time around includes many more colors and textures, and the brightest spot, the point where the sun is hiding behind the clouds, is properly exposed and clearly visible. Like the previous image from a year ago, the cars are there in the parking lot, but are kept to a minimum of one line at the base of the trees. It’s clear that this is a parking lot, but it only takes up a tiny portion of the bigger picture. Leading lines from the parking spots as well as the arrangement of the street lamps, though both darker, still draw the eye right back to where I want the viewer to look. 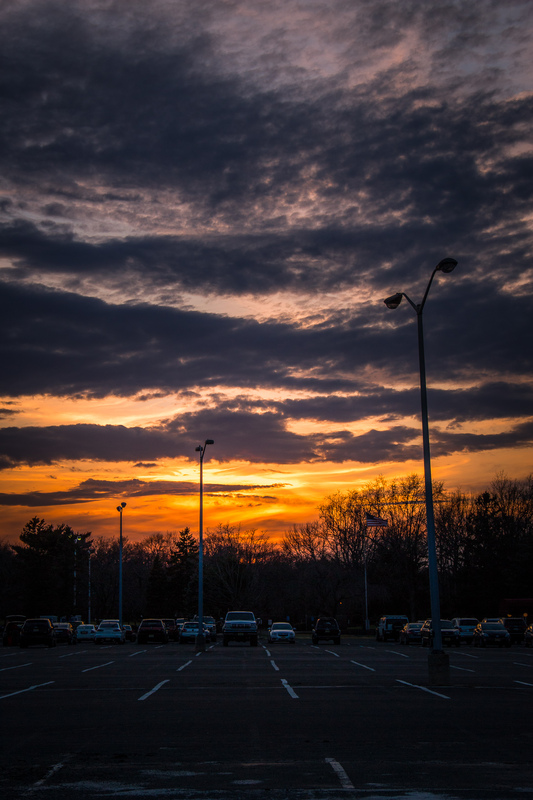 I also made the choice to include the silhouettes of the street lamps, which I feel make the image more appealing in that, while we still have manmade light and can see at night, none of it can possibly compare to the power and majesty of a sunset. Finally, I also chose to go vertical (portrait) with the framing rather than landscape, which I feel also adds to the power of this sunset. The texture of clouds at the top of the image is so different from that at the horizon, yet it’s all part of the same sunset which would not be visible with a landscape horizontal frame. 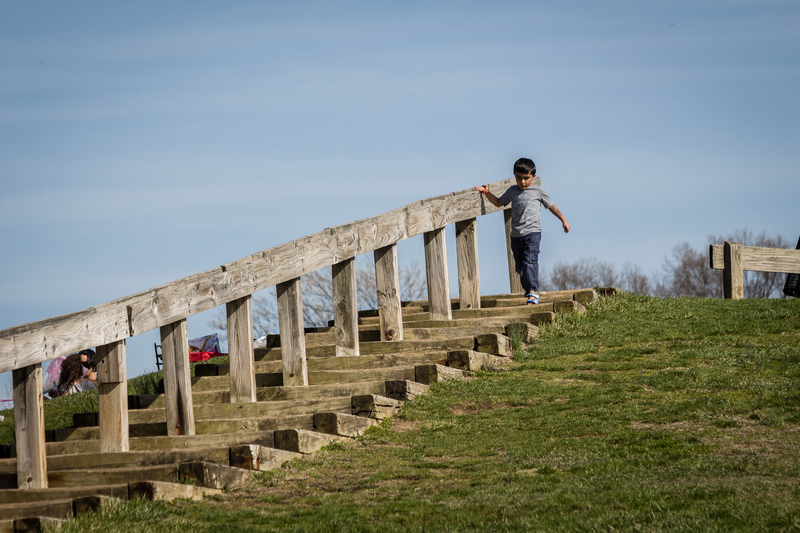 So, the hill at Laurel Acres Park is one of the park’s defining features. It juts up in the middle of the park, and one can always find kids or families running up and down the hill. I’m drawn to the diagonal line of the hill to contrast what’s behind it, and the green grass sets the scene for the park and the nature of the day. With the first image, I remember exactly what went through my head with my composition and approach (this was one of the first times I had inspiration and a solid idea which I wanted to create!). I wanted to include both the American flag and the broken grassy area, showing that parts of America are broken and in need of fixing. How noble and artsy. Once again, my sky is blown out, but I didn’t care at the time since the flag and the hill are both clear and visible. The broken grass is in focus, but only at the bottom corner of the photo. 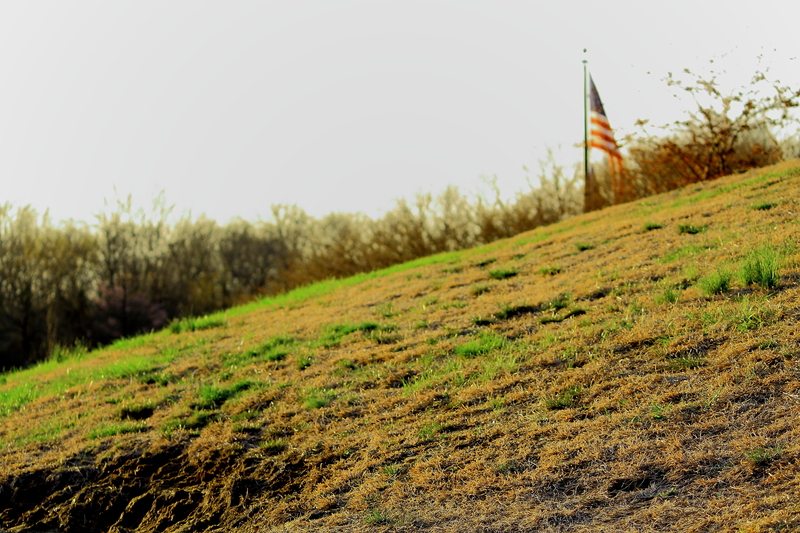 While I wanted the broken grass to be the subject of the photo, it just doesn’t carry over or suffice as a subject. The blurry flag in the back is distracting as it is the only part of the photo that naturally stands out, yet it is tucked away in the back, out of focus, and partially blown out within the highlights from the sky. The trees are still blurry and don’t really add to much to the scenery, though they add more chaos to this hot mess of a photo. One year later, I came back to the same hill with the same weather and same diagonal background. Compositionally, I’ve over-simplified this shot. Rather than including many elements (which, believe me, there were), there are only three this time: the grass, the trees, and the father/daughter. The grass and the trees are both clear, well-defined, and establish the scenery and mood of the day. The father and daughter are the clear subject of the image, standing out in both color, shape, and location. While they only take up a small portion of the photo, the composition (that diagonal line of the hill) still draws the eye back to them. Additionally, this photo is part of a story, whereas there’s no story from the same type of photo from one year ago. There’s something powerful about this father and daughter sitting alone in this landscape together. My photography is far from perfect. This post isn’t about patting myself on the back or saying that I’ve reached all my goals. This post is a reflection of my growth. It’s a way to look back as I look forward. Through this post, I can tell that my photography and my eye for it has improved over the course of a year, and I think the photos here clearly illustrate this. I will say that it’s taken me over a year to build the confidence to proudly stamp my name onto my photography with a watermark, allowing the public (people I know and soon enough people I don’t know) to see my work, see my name, and not cringe at the sight of a photo I’ve taken. Now I’m curious to see what my photography will look like one year from now and how my older self will bash and tear to pieces the work I am legitimately proud of today.